Most of the music I record does not involve a bassist. Either I am covering the bass with my left hand and/or left foot on the Hammond organ, or I’m using synthesizers. Two projects currently on my plate, however, do feature electric bass. The first is Greg Nagy‘s upcoming third release, tentatively titled I Won’t Give Up. For these sessions, Detroit bassist Joseph Veloz is handling the low-end. The second is my progressive rock project with Gary Davenport on bass duties. My humble studio is small and I do not own a bass amp. In my studio, I track the bass direct into a Universal Audio LA610 MkII tube preamp with just a hint of compression added on the front end. Joseph uses a nice five-string bass with both passive and active pickups. Gary sends me most of his tracks, recorded at his home direct into his ProTools audio interface. Both methods sound good, but they lack the roundness and fullness that a nice bass amp provides. I considered the option of re-amping the tracks into a bass amp at another studio, but this would cost both time and more importantly money. The budgets for both these projects are small. So I began looking for alternatives. A lot of companies make guitar amp simulators. Many DAWs even ship with them, including Cubase, which is my DAW of choice. 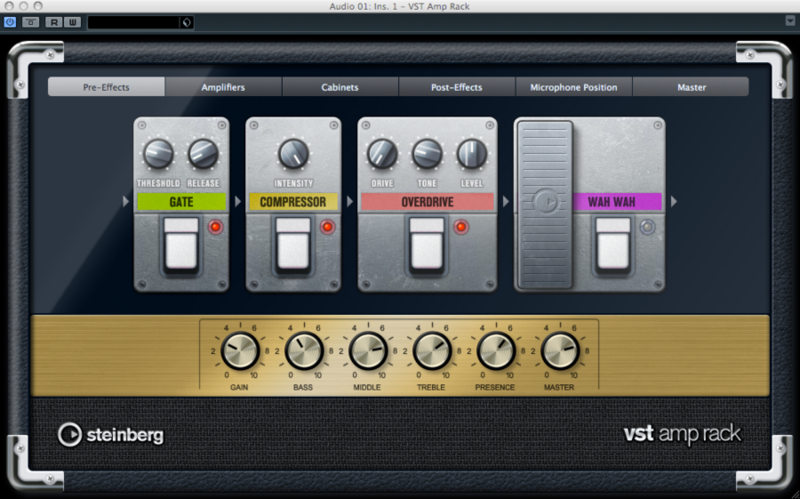 The VST Amp Rack plug-in within Cubase is quite good and I have used it on a variety of instruments like guitar, synthesizer, Wurlitzer electric piano, and even vocals. But like the majority of guitar amp plugs, it doesn’t have any options for bass. After searching and reading reviews and suggestions, I came across the Swedish company Softube. They offer a plug-in called Bass Amp Room that seemed perfect for my needs. I downloaded the fully functional 20-day demo (iLok required) and began testing. Immediately upon loading the plug-in the bass guitar tracks improved. And it wasn’t just a small improvement. The plug-in does exactly what it advertises. It takes your direct bass signal and puts it through an amp in a room with a mic in front of it. The results really speak for themselves and the Softube website has plenty of audio examples. Softube Bass Amp Room plug-in. 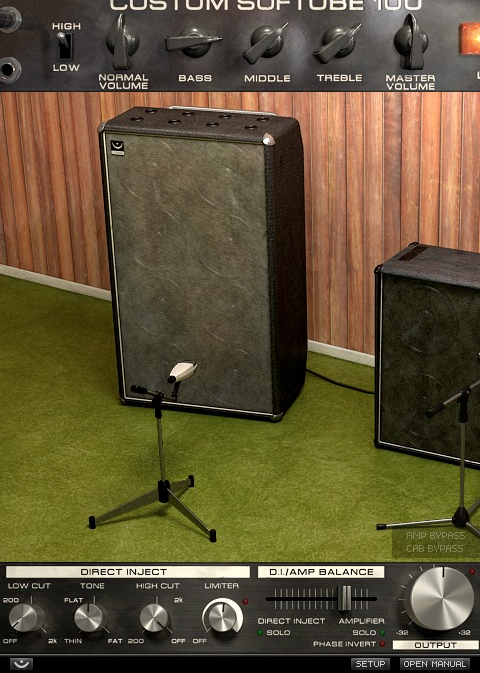 The plug-in models three different cabinets; an 8 x 10″ cab, a 4 x 10″ cab, and finally a 1 x 12″ cab. The amp controls are very straight-ahead; normal volume, bass, mid, and treble tone controls, and a master volume along with a lo/hi input switch. They even included a direct inject section to mix some of the direct signal into the amp sound. The DI section includes more tone controls and a limiter. You can bypass the amp simulation or the cabinet simulation. And you can position the virtual mic anywhere you want in front of the cabinets, backing it way off if you’d like or getting it up close and right on the cone. I do like how the amp model breaks up when pushed. You can achieve some great fuzz bass tones out of the plug-in as well as some beautiful dark crunch. I can only think of two areas which need improvement: It is odd that they did not model the classic 1 x 15″ cabinet made famous by the Ampeg B15 and James Jamerson. And I would like to see a cabinet with a horn. Perhaps those will be in a future update. Despite these caveats, I bought the plug-in from Sweetwater Sound, which is just a bit cheaper than direct from Softube. Below is a mix I’ve been working on. This song was recorded in Los Angeles in October of last year. The bass was tracked direct into Nuendo through a Demeter tube bass DI. This is Gary Davenport on bass, myself on organ, Zach Zunis on guitar, and Matt Tecu on drums under the recording band name The Hollars. We hope to have an EP out this year. I highly recommend Bass Amp Room to anyone needing a solid bass amp tone for their recordings. Check out the other amp models from Softube, too. It is worth demoing their Valley People Dyna-mite compressor plug-in. I had a real Dyna-mite at my studio for a week or so and compared the virtual with the real. They were very, very close (the plug-in had more high-end information). That’s on my shortlist as well.